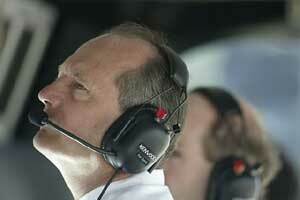 The boss of the TAG McLaren Group, the parent company of the West McLaren Mercedes Formula 1 team is Ron Dennis. Now 54, Ron was born and brought up in Woking, leaving school at 16 and becoming an apprentice mechanic at the famous Thomson and Taylor company at Byfleet. The origins of the this company went back to the 1920s when John Parry Thomas was building World Land Speed Record cars at Brooklands. After his death at Pendine Sands in 1927 at the wheel of his 27-liter Liberty aero-engined car called Babs, two of his engineers Ken Thomson and Ken Taylor joined forces to run a business in one of the sheds at Brooklands. They eventually relocated to Canada Road, Byfleet and continued to design and build record cars before settling down to more mundane machinery. Dennis was keen to learn and studied in the evenings at Guildford Technical College and when Thomson and Taylor was taken over by the Chipstead Group in the mid-1960s Dennis was transferred to another Chipstead subsidiary, the Cooper Car Company. His first job in motor racing was building up production Coopers for Formula 2 and Formula 3 use. By the time he was 18 Dennis had worked his way up to be a Formula 1 mechanic with Cooper, working with Jochen Rindt. In 1968 Rindt moved to Brabham and Dennis followed him but after Rindt moved on to Team Lotus, Ron found himself working as Jack Brabham's mechanic. When Black Jack sold the team to engineer Ron Tauranac at the start of 1971 Dennis and another mechanic Neil Trundle did a deal with Tauranac to run a pair of Brabham BT36s in Formula 2 and established Rondel Racing in Woking. The team made it first appearance at Hockenheim in April 1971 with drivers Graham Hill and Tim Schenken. Hill won one of the two heats but was beaten to overall victory by Francois Cevert in his Tecno. A week later Hill gave the team its first outright victory on Easter Monday at Thruxton. The team expanded to a third car later that year with Bob Wollek driving. That winter the same trio went to South America where Schenken scored the team's second victory at Cordoba. Over the winter backing was found from Motul and the acquired new Brabham BT38s. Wollek was joined by Carlos Reutemann with Henri Pescarolo taking part in occasional races in a third car. That year Dennis was working flat out and one night, while driving home, he crashed his car and was badly injured. It forced him into a managerial role and it was not long before Ron began to plan to build his own chassis. He commissioned Ray Jessop to design this F2 car for the 1973 and the Motul chassis appeared at the start of the year. Pescarolo won the second F2 race of the season and Tim Schenken added a second victory in the autumn. By then Dennis was planning for a Rondel F1 program. However in October 1973 the OPEC oil producers created an oil crisis and that winter Motul's sponsorship dried up and Dennis and Trundle had to give up their F1 dream. The project was sold to businessmen Tony Vlassopoulo and Ken Grob and they established the Token F1 team. This was never a great success. In 1975 Dennis launched his next project called Project 3 and after a low-key year began Project 4 in 1976, running March chassis. In the years that followed Dennis built up a series of successful teams in Formula 2, Formula 3 and the Procar Championship with backing from companies such as BMW, ICI and, most importantly, Marlboro. The team won the British Formula 3 title in 1979 and 1980 with Chico Serra and Stefan Johansson and the 1980 Procar title with Niki Lauda. In September that year Marlboro, unhappy with the progress being made by McLaren in F1, engineered a merger of McLaren and Project Four to form McLaren International and a year later Dennis took complete control of the operation. He then convinced Williams sponsor Mansour Ojjeh to join him and Ojjeh funded the TAG Porsche turbo engine program and the McLaren-TAG cars became the most formidable forces in F1 history, winning World titles with Niki Lauda in 1984 and Alain Prost in 1985 and 1986. In 1988 Dennis pulled off a second coup by signing Ayrton Senna to partner Prost and convincing Honda to leave Williams and support McLaren instead. The McLaren-Honda package was amazing and won 15 of the 16 races in 1988. Senna won the title but Prost had his revenge in 1989. The steamroller continued to win World Championships with Senna in 1990 and 1991. While this was going on the TAG McLaren group was growing. The TAG McLaren Group expanded to build a supercar called the McLaren F1 and to win sportscar races but the F1 program suffered. Honda withdrew from F1 at the end of 1992 and Senna left the team in 1993. There followed a series of poor seasons until 1997 when the new McLaren-Mercedes alliance began to produce results and in 1998 Mika Hakkinen and David Coulthard dominated the World Championship. That success continued in 1999 when Dennis sold 10% of his 40% share in the team to DaimlerChrysler AG. Dennis was honored with his appointment as a Commander of the Order of the British Empire in the summer of 2000.